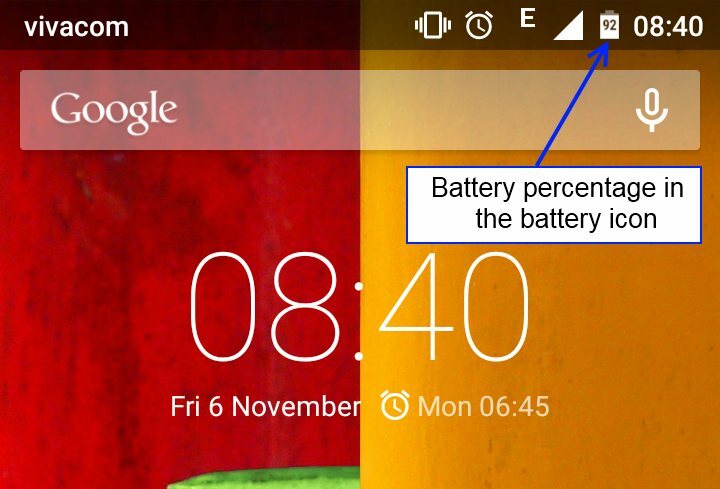 Android smartphones and tablets running stock version of Android like the Nexus phones and tablets, the Moto phones (Moto E, Moto G and Moto X) and so on, by default do not show the battery charge percentage in the notification bar, but only a battery icon. There are many apps in the Google Play store, which show the battery percentage in the notification bar, but most of them show it on the left side far from the battery icon, which is on the right. Have you ever wondered if it is possible to show the battery percentage at the right, where the battery icon actually is? If yes, then read on, as this is exactly what I'm going to show you in this article. Android version 4.4 (KitKat) and any newer has an option to show the battery percentage in the battery icon on the right of the notification bar. The result looks like on the screenshot above. Unfortunately, this option is hidden and not available in the phone's settings, but do not worry, you won't have to root your phone to enable it. Do not worry though, as you will not have to root your phone or do something special or nerdy to enable this. All you have to do is to install the Battery Percent Enabler application from the Google Play Store. After you install it, run it, select the "Enable Battery Percent" check box, exit the application and restart your smartphone or tablet. 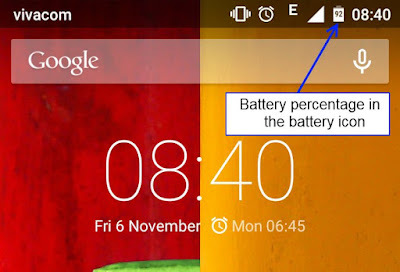 Note that on Android 4.4 phones and tablets the battery percentage will become visible only when it's below 50%, because the text in the battery icon is white and the battery charge background is also white. On Android 5.0 and later Google has fixed this problem and you will be able to see battery percentage from 99% all the way back to 0%.